Make a short video of you and your future husband/wife to be and tell us about your love story. 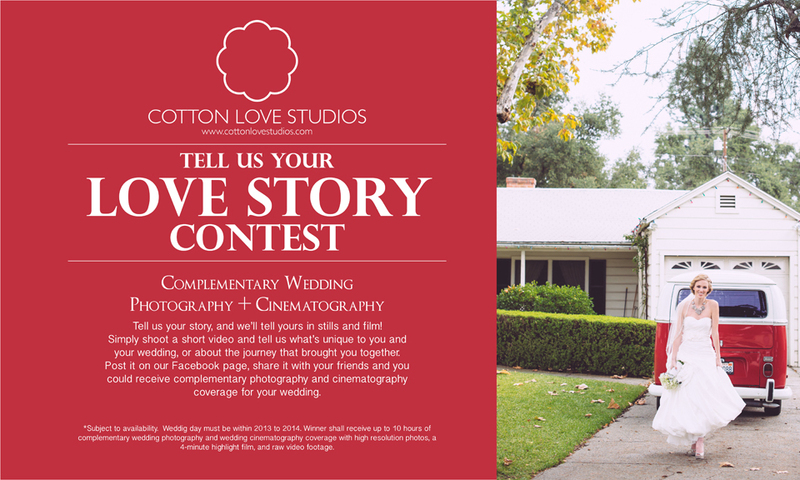 Upload it directly to our facebook page: www.facebook.com/cottonlovestudios (you’ll have to like our page first). Share it with your friends and get the word out! Wedding must be between 2013 and the end of 2014. Winner shall receive up to 10 hours of complementary wedding photography and cinematography with high resolution photos, a 4 minute highlight film and raw video footage. Submissions will be taken up until June 14th, 2013. We will announce a winner shortly after. UPDATE: We’ve extended the deadline by 2 extra weeks to June 14th since we know some of you out there are asking for a bit more time. So, here’s your chance! We’re looking forward to hearing all about your stories!